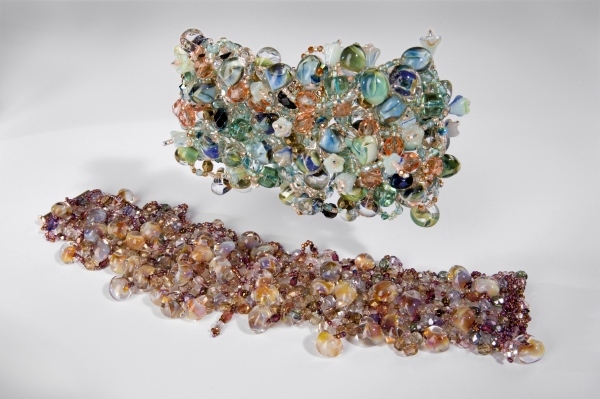 You are standing by your work space holding a baggie containing a variety of beads that form a pleasing color palette. The phone rings. The caller is a good friend, so you sit down at your work space to enjoy the conversation. As you talk to your friend, you pour the baggie full of beads onto the beading mat in front of you. You swirl the beads around with your fingers as you enjoy talking on the phone. The conversation ends, you look down at the beads on your mat, and you are surprised and delighted with the formation of beads in front of you. What you see would make a wonderful bracelet without changing a thing—but how are you to get the beads from your mat onto your wrist without disturbing the design and without the aid of some kind of spray adhesive? MY SUPPLY LIST IS TRULY A LIST OF OPTIONS. IT IS MEANT TO ENCOURAGE YOU TO SELECT VARIETY IN SHAPE, COLOR AND SIZE OF BEADS. THE MAIN IDEA HERE IS TO CHOOSE BEADS THAT ALL LOOK GOOD TOGETHER SO THE PLACEMENT OF EACH BEAD ISN’T IMPORTANT FOR THE OVERALL EFFECT. MAKE SURE YOU HAVE “ENOUGH” BEADS TO MAKE A BRACELET THAT IS ABOUT AN INCH OR SO WIDE AND WILL FIT AROUND YOUR WRIST. THE ONLY BEAD LARGER THAN 6MM WILL BE THE BOROSILICATE TEARDROP. ALL BEADS YOU SELECT MUST HAVE A HOLD BIG ENOUGH FOR USE IN RIGHT-ANGLE WEAVE. PEARLS WITH LARGE HOLES (HOLE THAT IS AT LEAST .09) CAN BE USED.